are none of the things I can boast of. You could say I'm always the second runner-up or the Burntoutactress being a drama Queen, the reigning Queen says the family jewels are for the aging Queen. Such is life. But sit me down to Pudding and I'm in clover! The real Queen of Tarts is swanning it all over the Garden route so I'll make hay while the sun shines and deliver my repertoire. 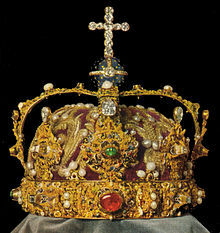 Let's get on with it before I say the wrong thing and get myself into a right royal mess. I'm Pudding on the Ritz with four of my all time favourite desserts, but before I do so I'd like to encourage you to make a reservation at the Roundhouse Restaurant sometime this summer. Nestled in the glens of Table Mountain near Camps Bay, with breath-taking views of our magnificent coast-line. The food is fit for a queen. Last time we were there, I'd just passed an exam, and my Precious treated me to a magnificent meal with all the bells and whistles. If I was a condemned man my last supper would be the Lemon Souffle I had. 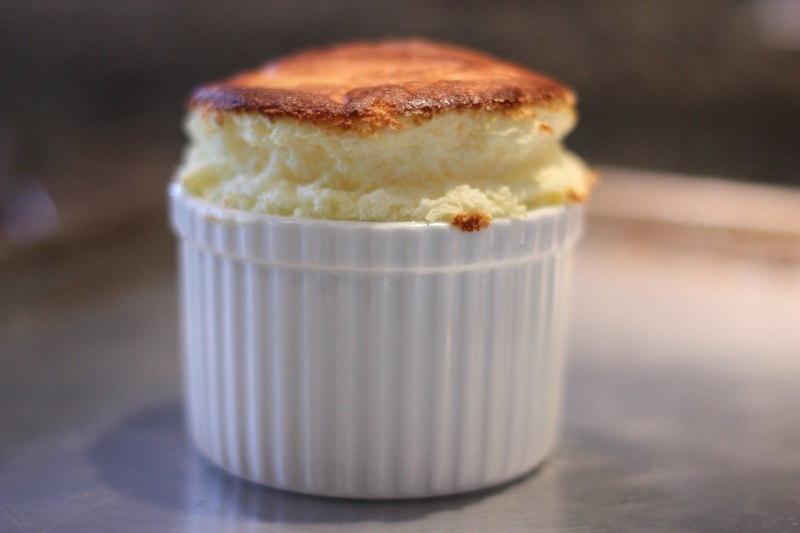 ("it's who you know not what you know" our Princess would warn, this was her recommendation), a rich, golden featherweight puffed-up Souffle with a tarty twist, the Coup de Grace was the plunge a quenelle of richest vanilla ice-cream made into the heart of my beautiful Souffle. The Champagne complimented perfectly. I'm always keen on a Taster Menu as it satisfies the glutton in me. No need to hold the sword to my neck I unashamedly confess I salivate at the memory. This is Fine Dining at it's best. Of course, reservations are essential. Sift flour, salt and sugar into a mixing bowl. Cut the butter into small pieces and work into the flour until small crumbs form. Sprinkle with a little iced water (the less you use the shorter your pastry will be). Or use a food process fitted with a steel blade. Process until dough begins to form a ball. Gather dough into a ball, drawing in any dough sticking to the sides of the bowl. The dough should be moist but not sticky. Wrap in cling film. Chill for 60 minutes before using. Break off pieces of dough. Press into a 25cm tart pan with a loose bottom (quiche tin). Making sure you cover entire area. Bake at 175°C for 12-15 minutes, until crust is a delicate golden brown. Remove from the oven. Beat egg yolks with 125g sugar until thick and creamy. Whisk in lemon peel and juice. Place in a double boiler and cook over medium heat until the custard coats the spoon. Stir constantly but do not allow mixture to boil. Once cooked cover the top of the curd with cling wrap preventing a skin forming. (This may be done a day before and refrigerated and the tart may be completed later). Whisk egg whites with cream of tartar until stiff peaks form. Gradually add 45g sugar when egg is foamy. Using a metal spoon, gently stir a quarter of whites into yolk mixture (lemon curd) and carefully fold in remainder. Keep it light and do not overwork. Spoon into the cooked and cooled tart shell, mounding mixture slightly in the centre. Bake at 175°C for 12-15minutes until top is golden. Switch the oven off, open the door slightly and allow to cool. Sift a little icing sugar over the top just before serving. This recipe may be adapted to make 6-8 delicious individual tarts using small fluted pans. The pastry case can even be frozen to be used later. The easiest and quickest cheats Ice Cream in the world. In a large bowl place the ice cream and whisk slightly, the ice-cream must still be partially frozen. Add the frozen orange juice and all the other ingredients. With a large metal spoon fold all the ingredients together. Work quickly. Return to a large container and refreeze preferably overnight. 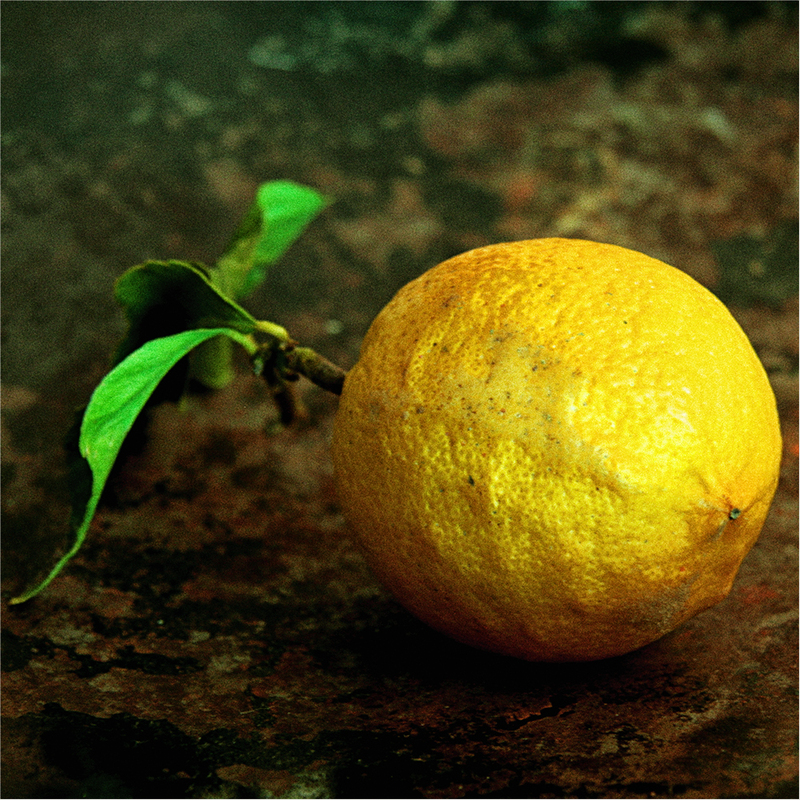 • A citrus flavoured ice cream works very well with any Chocolate pudding, fruit salad, crème caramel and other citrus or vanilla flavoured desserts. • Makes an excellent topping for waffles, pancakes or filler for cones. 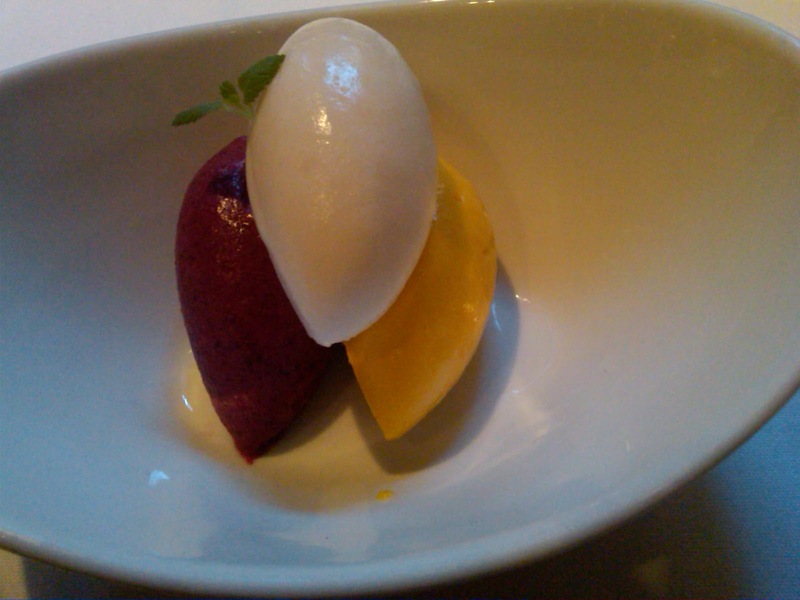 • Make either quenelles or ice cream balls and serve. • If served solo have a deliciously decadent Hot Chocolate sauce on the side. Heat the granulated sugar in a dry saucepan or heavy bottomed frying pan until the sugar dissolves and turns golden caramel syrup. Remove from the heat and add the water, be careful as the mixture will bubble up with the addition of the cold liquid. Return to the heat and swivel the pan/pot to soften the caramel. Pour the caramel syrup into 6-8 individual ovenproof ramekins or old tea cups. Hold the ramekins in a cloth to protect hands. Gently tilt to coat the base and sides evenly. Place the ramekins in a shallow baking pan or roasting pan. Heat the milk and cream together with the orange rind and lemon leaves to just below boiling point. Allow to infuse for 20 minutes off the heat. Pre-heat the oven to 140°C. Lightly beat the remaining ingredients in a mixing bowl and gradually stir in the hot milk until well blended. Strain into a jug and pour liquid into the prepared ramekins. Fill the baking tin to a depth of about 2,5cm with boiling water, ensuring that it is below the top edges of the ramekins. Cover the pan with greaseproof paper and place in the centre of the pre-heated oven. TIP: this dessert may be made using one round cake tin. Bake and allow to cool in the water bath. Turn out onto a big platter, be careful when turning the dessert out as the liquids may spill, so work quickly. Pour into a bowl and beat on high for 15 minutes until soft peaks form. With a metal spoon fold in the corn flour. Scoop 8 dollops of meringue onto the baking tray and scatter the almonds on top. Bake for 90 minutes. Turn the oven off and allow the meringues to cool in the oven. To make the vanilla syrup: place all the ingredients in a saucepan or pot and simmer until they form thick clear syrup. To serve: place each meringue on a beautiful dessert plate; finish off with a large dollop of whipped cream with a pinch of sugar and a scraping of vanilla pod added to enhance the flavours. Garnish with fresh berries and drizzle some of the delicious vanilla syrup over the top to finish off. I gave the recipe for beautiful baked peaches in an earlier posting; serve them with the meringues and cream. Yummy! Baked stone fruit is always a show stopper. 1. Break the chocolate into small pieces add the brandy and the golden syrup. 2. Melt the chocolate over water in a double boiler, ensuring that the water does not touch the pan above, stirring frequently. Once chocolate has “burnt” it’s no good so be very careful when melting chocolate, do it over a medium to low heat once the water is hot. 3. 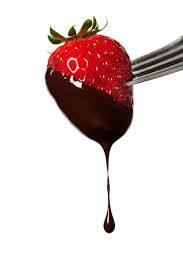 Once chocolate is melted remove from the heat and the water and allow cooling to room temperature. 4. 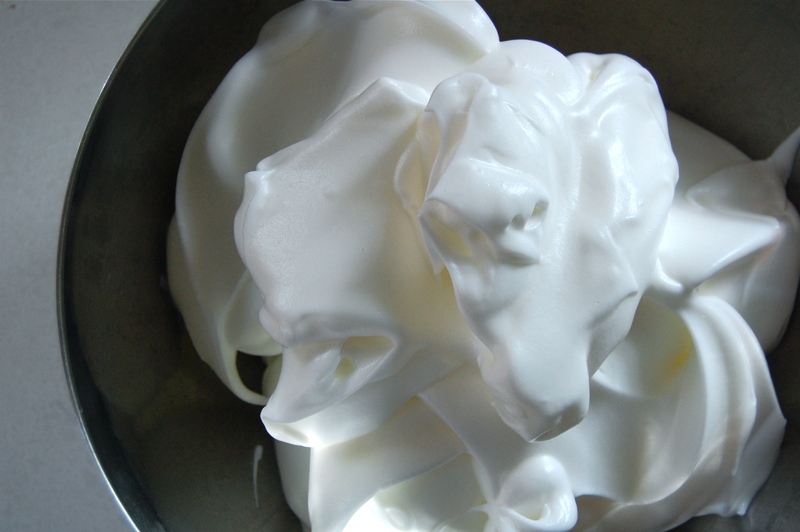 Whip the cream until a soft peak forms (do not over beat). Keep cold. 5. 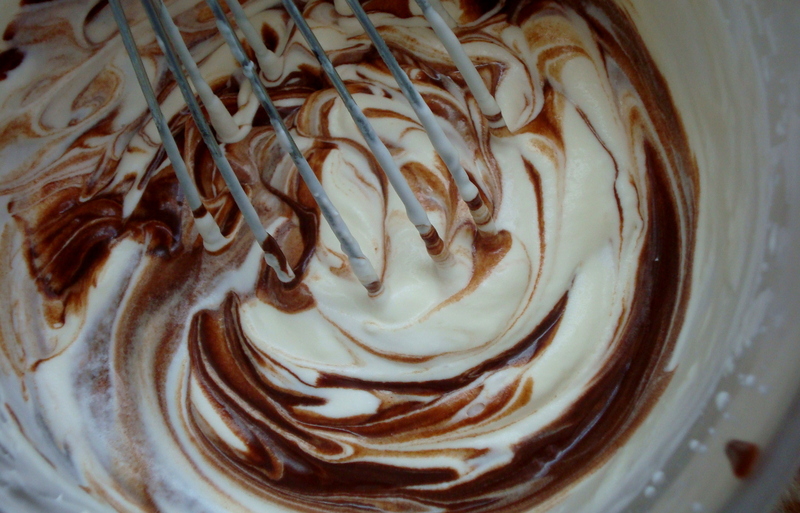 Carefully fold 1/3 of the cream into the chocolate mixture, then another 1/3 and lastly another 1/3. 6. Spoon into a pretty glass bowl. 8. Pile strawberries dipped in melted chocolate onto the centre of the Mousse just before serving. Pile any berries instead of strawberries. Pile chocolate balls instead of fruit or a mixture of fruit and ball for a festive treat. Dust with culinary gold dust or icing sugar or cocoa.